Long Island McDonald’s and fire safety product manufacturer Kidde donated 250 Kidde smoke and carbon monoxide alarms to Nassau and Suffolk county fire marshals. Nassau County Assistant Chief Fire Marshal Mike Uttaro presents a proclamation to Long Island McDonald's. Garden City, NY - October 4, 2017 - Nassau County and Suffolk County are joining forces once again with Long Island McDonald’s to kick off their 31st Fire Prevention Month together, a initiative running throughout the month of October which aims to spread the word on the importance of not only preventing fires in the home, but also arming residents with the know-how for how to survive one, should it unfortunately come to pass. 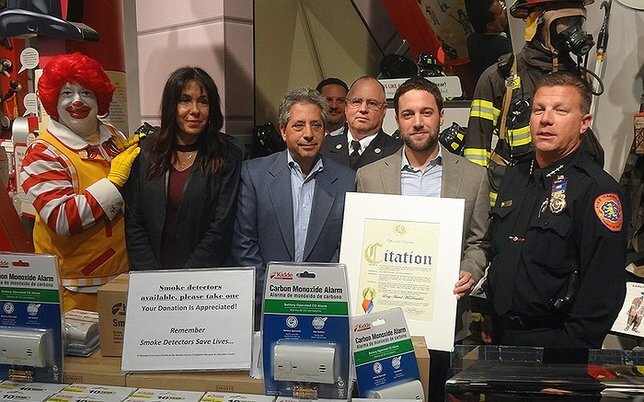 The event, held in the form of a press conference on October 3 at the Nassau County Firefighters Museum and Education Center in Garden City, attracted a number of local businessmen, dignitaries, and firefighting personnel. Museum Director Alana Petrocelli, who oversaw the proceedings, said that while October is indeed Fire Prevention Month, fire safety is something that should be taken seriously year-round. As is the case every year, Long Island McDonald’s and Kidde – a leading manufacturer of residential fire safety products – donated 250 Kidde “Worry-Free” 10-year sealed lithium battery smoke alarms and 50 carbon monoxide (CO) alarms to Nassau and Suffolk county fire marshals. The vital home safety devices will be given for free throughout the month to children and families who are unable to afford them, according to Suffolk County Fire Marshal Don Lynch, who was also in attendance at the event. Nassau County Assistant Chief Fire Marshal Mike Uttaro echoed the sentiments of his comrade from Suffolk County, saying that the single most important thing a family can have in their home to safeguard their lives against the threat of fire is a properly working smoke detector. To help spread the word during the month of October, local Long Island McDonald's restaurants are giving away a fire safety quiz to their young customers; on the back of each quiz, there is an escape plan that follows Fire Prevention Month’s 2017 “Know Two Ways Out” theme. Once children have established that they are aware of an effective escape plan from their home and all activities on the quiz have been completed, they can turn in a coupon that comes with the sheet to receive a free grilled chicken snack wrap and a drink (with any purchase) from their local participating Long Island McDonald's restaurant. Josh Kaufman, President of the Long Island McDonald's Owner and Operators Association, noted that his organization represents 80 McDonald's restaurant locations on Long Island, and that this year represents their 31st annual participation with the Nassau and Suffolk County Fire Departments in their Fire Prevention Month initiative. 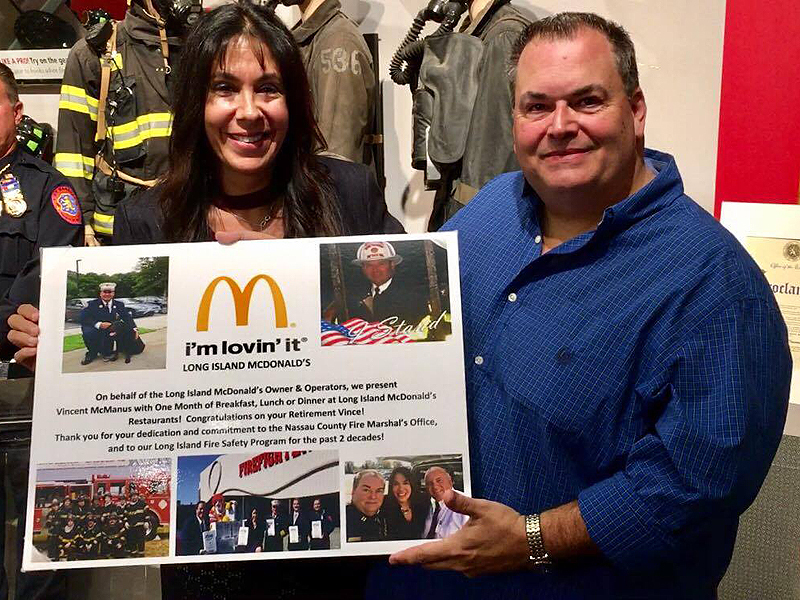 Luciana Montuoro, Long Island McDonald’s Marketing and Public Relations Director, said that she takes pride in the fact that her organization has been very active and entrenched in the communities in which they do business. Subject: LongIsland.com - Your Name sent you Article details of "LI McDonald’s, Nassau and Suffolk Fire Departments Kick-Off 31st Annual Fire Prevention Month"